» The Site Has Moved! Humans always thought that they know everything about their world and that they are only supreme rulers of earth.Little they know there were far more stronger inhabitants that lurked in shadows hiding from human eyes.Creatures of fairy tailes and myth were waiting for right moment to reclaim what was theirs to begin with.People started to notice strange creatures all over the places mosters that they thought exist only in stories years passing activity of monsters rose.It become more agressive they started to attack humans even ravage their villages and towns.Of course goverments didnt wanted people to know truth and covered it as wild beast attacks or naural disasters.Years passing attacks become more brutal monsters begin to attack in midle of day there was report of group of hellhounds attacking children dragged into woods by tall faceless man.Humans knew they need do something to stop monsters.After few days a man wearing black mask with silver ornaments calling himself "L"contacted with world goverments and offered them a deal.He will purge world from monsters in exchange of power and resources.Humans were in despair they agreed with man that called himself L he created organisation and called it "D.E.A.T.H. "(Demon Encounter And Theologist Home)an organisation that work as peace keepers between human realm and monster realm trying to capture monsters and inprison then so they couldnt harm anyone.Soon it become place for lost souls.Humans that were gifted with unique powers or S.Ns that agreed to co-opperate in exchange of peaceful life. NOTE:You wont have weapons from you have to pass test before optaining your ANIMA. Sign Ups are now closed, and the posting order shall go as such. Note that when it is your turn to post, you have five days starting from the last post's time stamp. If five days have gone since your turn to post, the next person to post may skip you and continue on with the roleplay. You have been warned. 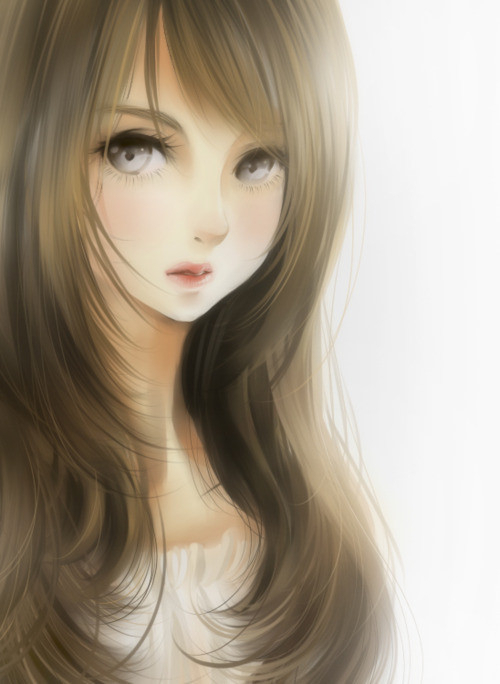 Personality:Loyal,Calm,Silent,Well mannared,Never speaks unless spoken to,Intellegent,Always observe before acting,tries to hide her feelings. Bio/Reason of joining D.E.A.T.H:Alisa is an orphan that was sending from house to house and always ended up returning in orphanage.Families that took her in soon would learn that she is not ordinary girl.Most of time Alise would say something that would freak people out.At age 5 she even managed to tell her new parrents fate she simple looked at their faces and said"You will die"next day couple died in car crash once again Alisa was send back to orphanage.Years passed and no one else even dared to talk with her or look in her way she was left alone.At age 10 she ran away from orphanage and even managed to find job in traveling circus as future teller but not many people were happy with her future telling neither was owner of circus.At age 14 she was kicked out and since then lived in streets she promissed herself never again use her powers.She kept her eyes blind fold with red scarf.She pretended to be blink and most of people used to leave her alone. Reason of joining:Wanted to be understood and find place that she could call home. Anima:A silver left gauntlent made from sturdy yet very light and thin metal next to wrist there was attached from same metal made japanese sword sheath with katana in it.Sword looked like traditional japanese sword but it made from strongest metal in world called"Paladinium"which was found only in paranormal world it was light yet strong enough to cut through tank armors.However it couldnt be used harm humans blade would simply fold into handle it activates only when its user really need it. Others:Always covers her eyes with scarf not wanting to see other people fates. Personality: Kind, understanding yet driven and determined. Always a good leader, but takes the role of defender in a group. Power/Abilities:Heightened strength, speed and senses. 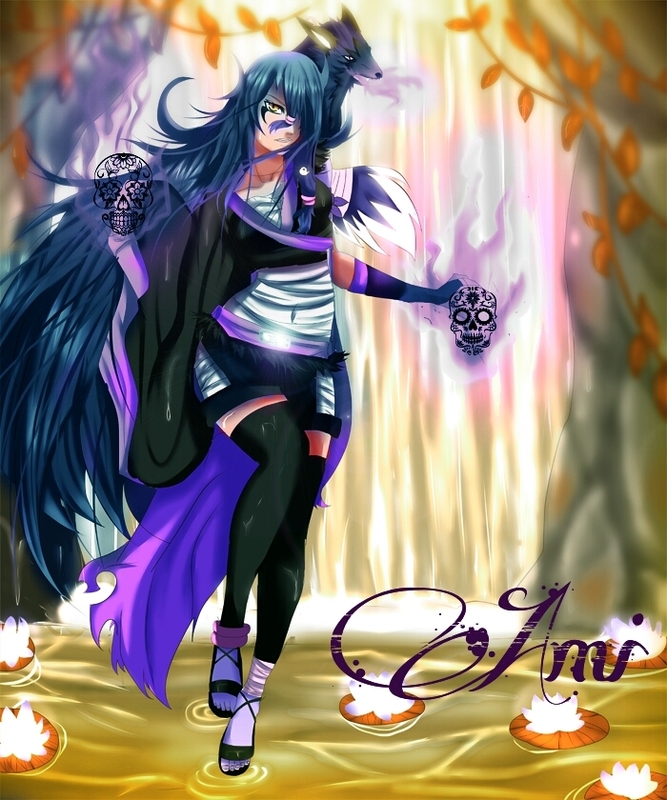 Bio/Reason of joining D.E.A.T.H:Her family were killed by a dark fire sprite and since then she had the need to protect others from going through the same pain she had. Anima:A silver, snake like armband that winds up from her wrist to her elbow, the snake's head being at the base of her hand. When active, her anima acts like a living snake, slithering down her hand until she grabs it's tail where it becomes a whip. The whip is highly effective in binding certain creatures weakened by silver. Others:She rarely sleeps due to nightmares of the fire and often feels the need to have a fire user on her team to protect her from fire using creatures. Subject: Vampiric male, age appearance of late teens early twenties. Description: On (Classified), D.E.A.T.H. HQ came in contact with reports of an attack on civilians at (Classified) by a tall slim faceless figure in what was described as a black suit. Squad 02A was sent to investigate. 73 minutes later Squad 02A arrived a location and began investigation of the area. After 15 minutes, static noises and disruption of instruments began to occur. Contact was maintained yet harder to hear as visuals also became blurred. Three minutes after this event, squad mate Arnold Rodriguez suddenly went silent and his vital signs disappeared. Squad leader and commander Kairi Kurokawa tried contacting Arnold with no results, and ordered her squad to find him. Five minutes later a scream was heard by squad mate Jessica Miles, as her vital signs also vanished. Kairi ordered her remaining squad to source of scream. At this time visual was completely lost and sound was interfered with by loud static. Two minutes later sounds of gunfire and screaming could be heard. Contact was attempted to understand situation but static interference prevented squad from receiving orders. Vital signs of all remaining squad members began to drop one at a time until only commander Kairi was left. Then over static, a loud hissing noise and screech was heard as sounds of explosions and destruction could be heard, with commander Kairi being completely silent but vitals still alive. This continues for four minutes and twenty-eight seconds before static interference faded away and visuals came back. Sight revealed was a complete destruction of the local (classified) and the bodies of all squad members were (classified). However standing among the wreck was a young blond male, covered in many open wounds, wearing shredded clothes, and bleeding profusely from the chest due to an open wound. 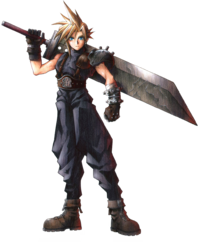 Boy then turned to commander Kairi, revealing a set of pure black eyes, and asked if she was alright. Kairi responded in term by aiming her sidearm at the figure, who stood in place and stared with possible concern and worry. Boy continued to insure he wouldn't harm commander Kairi, but commander Kairi ordered the boy to explain what he did and what he was. Suddenly boy began wavering back and forth before falling over. After a brief moment of recollection and recovery, commander Kairi walked over to the boy and checked on his vitals. No pulse and unmoving. Classified as dead. However analysis equipment and sounds amplifiers suddenly picked up a groan of pain from the boys' mouth and twitching of body. Commander Kairi confirmed the noise and movement, but was still unable to pick a pulse up from boy. Commander Kairi was then asked to open the boys mouth by (Classified). What was found was a set of incisor teeth along upper jaw. Subject was tagged as a vampire. After a moment of checking on the remaining squad, commander Kairi was ordered back to base with the vampiric subject for debriefing and interrogation. Upon awakening, the first words were concern over commander Kairi, much to everyone's surprise. When asked for subjects name, subject introduced himself as "Necro". Pair of black metallic gauntlets with sharpened finger tips and bladed edges. Gauntlets reach up to elbows and are each embedded with a gem within on top of the hand, right one is red, left one is blue. Each gauntlets sharpened "claws" are able to slice clean through most man made material and even supernatural ones. The gauntlets are also extremely endurable, able to take hits from supernatural and technological based weaponry and attacks and remain unscratched. Main feature of the gauntlets are the pair of "angel hairs" that emerge from each finger tip. The "hairs" are a set of very thin strings or wires that are near invisible to the human eye and can be manipulated and twisted by Necro to grab hold of or slice into anything he wishes. The "hairs" seem to have a maximum range of 10 meters and are able to slice clean through almost any material. Necro himself can control whether the strings will slice into an object or not,. Others: Refers to a "master" who he does not speak name of, but is confirmed to be female. Refuses to feed on the blood of anyone. Charged for series of murders (Refer to file I-Vandal) this subject was taken in by the foundation as a Class d operative. However this subject survived longer than any other Class d operatives causing him to be classified as a S.N. It was decided that the subject should be contained for further studies as he is somewhat unstable. According to the analysis provided by Dr. :":": the subject shows frequent number of irregular mind waves but it doesn't show much of a threat however the subject is classified as Euclid due to the incident revolving around him before he became a Class d and the lack information about him and his abilities. Dr. Flecther: Good evening Vandal, how are you feeling? Vandal: Hello *sighs* I'm feeling tired. Dr. Fletcher: Well you don't mind if i ask some questions?. Vandal: I'm telling you it wasn't me!! Dr. Flecther: It doesn't involve the incident, it won't hurt i promise. Vandal: (Remains silent for a couple of seconds then responds) Go on. Dr. Fletcher: Very well....Now when did your.... ability manifest? Dr. Fletcher: Can you be a little more specific? Vandal: The day of the murder. Dr. Fletcher: Can you tell me more about it? Vandal: I don't remember much all i know is that guy was coming after me and then i blacked out. Dr. Fletcher: Hmmm.....Very well, i have a task for you, please follow me now. Experiment: Subject was given the instruction to remain in a solitary room with a class d operative and specifically told the subject not to phsically interact with anyone in the room no matter what. This was recorded via cctv camera and analysed. Note: The class d operative was given the instruction to attack the subject with a knife. Outcome: The class d operative was stabbed by his own knife however it wasn't lethal. Recordings show that the subject didn't touch the knife or reacted to the assailant in anyway in fact it appeared as if the attacker stabbed himself. During the interview with the class d he told that the knife moved on its own as if he didn't have control of it which indicates that whenever the subject's powers react on natural instincts however further testing is required before coming to this conclusion. Experiment: Subject was blindfolded and kept in a isolated room, the Subject is instructed to describe the surrounding area including the next room. Outcome: subject accurately described the surrounding area in the testing site, however Subject went through mental stress as he attempted to "analyse" the other room. According to the information gathered from this we can conclude that the previous hyphothesis from the previous experiment is invalid as he simply didn't react, infact it is probable that the Subject contains two souls, and detaching either one of these two will cause the subject to undergo psyche stress. Dr. Fletcher: Can you describe what happened during the last test? Vandal: Ok.... after a few minutes being blindfolded i heard a voice speaking to me. Dr. Fletcher: Oh? What did it say? Vandal: It told........ (DATA EXPLUNGED) and that's that. Dr. Fletcher: Interesting, well good work today Vandal, now please get some rest, i'm sure you'll need it. After a few sessions the Foundation decided to place the subject in the special task force specialized in the containment and capture of Class-(Data Explunged). Please take note that this subject is unstable when threatened so handle him with extreme caution. This gun is registered to the user by reading the brain pattern of the user, since the subject has a unique brain pattern this weapon can only be used by him. This gun can analyse the threat level of a target and can change into two different modes according to the threat level as followed. 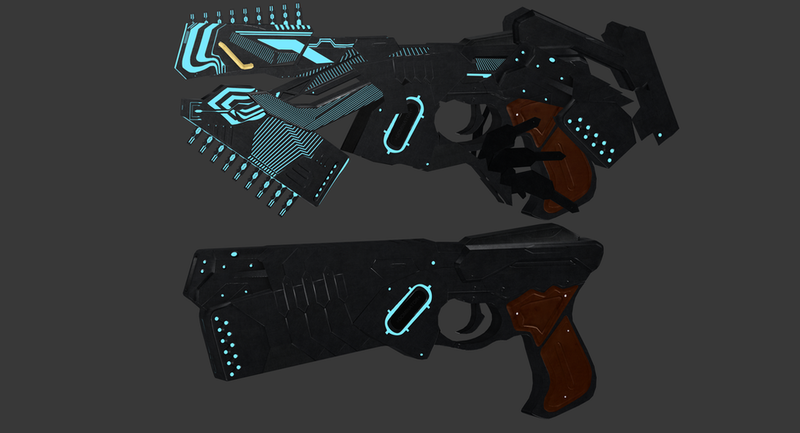 Non-Lethal Paralyser: The Dominator's standard mode fires energy bursts that paralyze the target. The gun does not need to transform for this mode. Used to capture suspects in order to safely bring them into custody. The effect may be reduced or negated if the target is under the influence of strong stimulants. Lethal Eliminator:The anti-person lethal mode of the "Anima". When it changes to this state, the upper portion of the gun undergoes a rather elaborate transformation which includes swiveling, sliding and flipping around most parts -while the gun tells it's user to what mode it changes- and takes somewhere between two and four seconds. Bio/Reason of joining D.E.A.T.H: Classified only known information is that he is the youngest to ever join D.E.A.T.H. 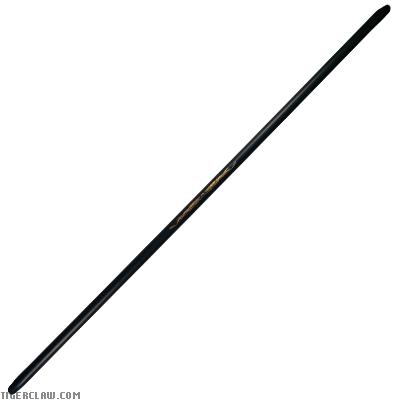 A Bo Staff made from an extremely light yet durable alloy known as Gravitite. A metal that is not only impervious to changes in the gravity but is light enough to be handled by an infant yet sturdy enough to handle a constant beating from steel and can hit just as hard. Other: Quote: "Pretty sad when they send the young ones out to clean up after the adults. Frankly you're only embarrassing yourself." Species: Woren - A Tiger-Like Human, with distinguishing features such as fangs, claws, a tail, and fur should the person allow it. 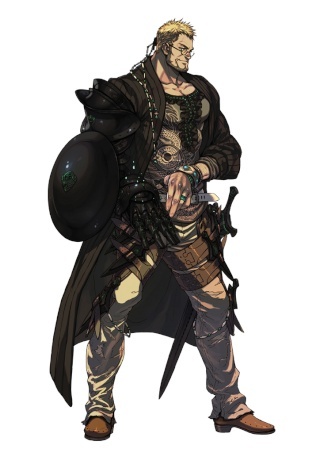 Berserk Mode - Letting loose to his wild side, Lukas is capable of transforming into a Weretiger, in exchange for his mind becoming unstable and attacking any living thing, friend or foe. Extremely dangerous if no one can control the unstable mind. We had an urgent call today about a huge creature causing a massacre in a nearby village, so of course the group Biggs and I are part of got sent to check it out. However, it was strange when we were told to tranquilize the beast instead of killing it. As our group arrived, we searched for the beast most of the night, with no success. In an instant though, three of our members went up and missing in the blink of an eye without any idea where they were, that is until we heard the screams. We rushed towards the bawling of our missing comrades, to see our last living member shrieking for mercy, as the monster began digging his claws into his skin. We immediately began firing the drugs into the beast, hoping that it wouldn’t take long for the beast to fall unconscious. The instant the first few tranquilizers punctured its skin; it averted its attention towards us, its slit eyes glowing and staring back at us. It dropped our last missing member, and let out a tremendous roar, as it pounced straight towards us. In desperation, we continued firing the rounds trying to get as many on the beast. It showed no signs of stumbling, and continued its path towards us. It swung its arms, sending a few of our guys flying as if they weighed nothing. As the beast headed towards Biggs’ and my direction, we fired our last rounds, and finally the beast began swaying back and forth. We stepped back and watched as the beast collapsed. We quickly grabbed our able-bodied men and brought the beast back to headquarters, shutting it in our strongest cage for the rest of the night. We suffered three deaths, and three times as many casualties, which surprisingly may be one of our better days. Nightfall and Eclipse - A sword and shield combo. The shield is capable of expanding in size, up to a circumference of Lukas’ height, without gaining any additional weight. 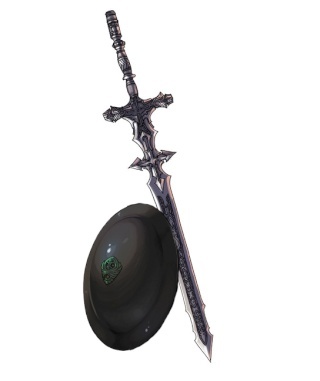 The sword is just as durable as the shield, and is rarely used. Others: After seeing footage of his massacre, Lukas prefers not going berserk unless absolutely necessary. He would rather detain instead of killing anything. Occupation: Was a priestss that specialized in spiritual cleansing and healing. • Healer for D.E.A.T.H. members. Skills: Seeing and communicating to the dead, purifing spiritual energy, working on guiding spirits, and raising them for help with what she can't handle. • Never learned the last two. Instead she studied on how to heal others with her powers. 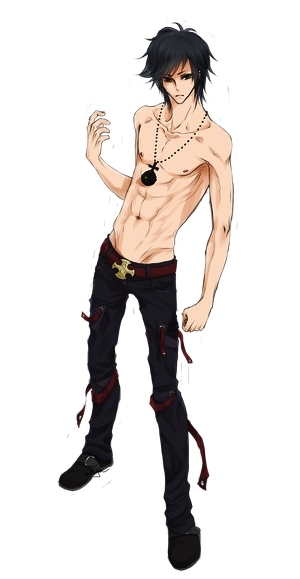 Body type: toned, has a bit of fat but it hardly noticeable. She is fit. Clothing: on her torso and legs, she wraps the in bandage. She wears black, slightly lose, but form fitting cotton shorts. Her tool is a bikini kemono top. It has one long sleeve that covers one arm. And the other sleeve had been ripped off. Also black. And has a dark purple trim. • Hates wearing the uniform the orgination gave her. Mostly because it irritates her scares from the testing done to her as a child. So, she just caries it around in the sleeve. Attitude: She is quit and tame. And always seem to be watching everything around her. There are times when she has a bit of rage viewing through her, but that is due to her inability to speak. Characteristics: She is extremely quit, and can wait. She will sit up high, or be digging some hole almost in search of something. She can be cunning and sly. She was born to a rich couple, but she had ears and a tail. Both had been worried about this. The parents did everything they could to find out what they could of this. By the age of three she had many visits from doctors till one defeated something the parents never dreamed of. Sending her to a growing clan of those like her. The plans for her to go, and the preparations for the trio, and the trip itself would take two years. Since she had to go through so many tests when she was younger. She had been too afried to speak. And the few times she would go to speak. She couldn't utter a word. The sound would just not come out. No matter how hard she tried. Once she was there she slightly blacked away from the other children. Climbing up into one if the trees and just watching. Sometimes she would sit up in the trees or she would dig a hole and hide there. When she became sixteen she started communicating with the dead, seeing strong images of those that passed. And then being able to get them to move on. She began learning how to cleans away bad spirits and heal those who have been insnared or possessed by them. Since she had learned the basics of this. She had started to go off a few times. To go and work as a cleanser and healer or the spirits. Now seventeen, she had come lightly do this a total of four times. And have gotten ill after each time. The severity of her illness was a reflection of how sever the job was. Before her first job she had gotten throwing knives to protect herself. And then the small bits of equipment she might need if simply talking and guiding the spirit onto the right path with her energy didn't work. Between jobs, and when she was well. She would light sage in the home underground that she had dug. It was just a huge hole under inks of the rather large tree. And it held mats for sparing. On the walls were the ornaments she used to hold her sage and incense. Lighting them with select matches she picked herself. While she would practice her Tai Chi. Only to help keep her of sound mind, and to release any lingering negative energy from her. If she wasn't doing that she was watching everyone else. Gathering what she can and using it to her advantage. Not to harm, but to help the clan. Even though they would get mad at her for doing so. 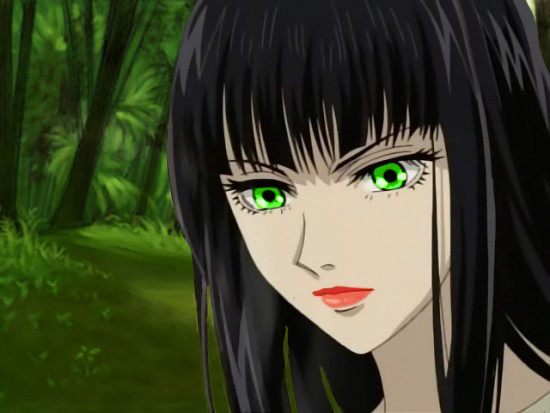 Doesn't remember how, but has found her clan dead, and an outsider who would have given her hope for a new home. With this, she gave up on trying to raise the dead to fight for her. She had learned to use what spiritual power she already knows to heal humans, and other creatures with in the D.E.A.T.H. organization. Curse Severity & Traits: sever, she has black Fox.ears and tail, and she has black markings around her eyes that come down to a point. She has sharp teeth and claws. She often dosen't hide her ears or tail. It just so happens that her hair does so, itself. Fighting Style: She uses Tai Chi, but only if she has to defend herself, but she is more ranged. Trying to work on raising the dead to fight along side her. Weapons: She has thin throwing knives to use to protect herself. Sage, incense, matches, a small black and purple bowl for burning sage and incense on. Reason for joining D.E.A.T.H. : Seemed like the thing to do when it had been offered to her as an option. Health: She can be prone to being ill, but as a caution she makesbshe she is as healthy as can be. Mentally and emotionally, she is other wise. Handicaps: Mute and can easily get ill after each purification. • Healing sessions can also make her sick, just not as much. Addictions: Chai tea, burning matches, sage, and incense. Body Type: Slender, and fragile looking. Personality: Quite, crul, kind in her own way. Lets just say, its different? Power/Abilities: Able to use her own blood to take shape of a weapon. Once someone elses blood is visable, she can use that visable blood as a weapon. Reason of joining D.E.A.T.H: Captured into joining. Anima: Micstand(post D.E.A.T.H.) Hook and Spiked knuckles. Others: Legend says that there is a type of ceature that was before vampires. A demon that could walk in day and night. Cold and calulating, feeding off the other demons that came across its path. One that escaped, having lost its power as a demon. Spread the ledgend of her being able to turn demons to humans. When the news spread to humans, one who saught out to be a demon. Thought it would be preferable to do so by this. And a demon he had become, thirsty for blood with a vilont temper, and a lustful wish for death. Yet an undying need to stay alive.He had become a vamiper. Many othe humans have done the same through out the ages. Yet, one wanted to put an end. For when leadgends go from ear to ear by the tounge. They twist, and turn into half truths. Being saught out, turnd to seaking out, and eventually hunting down. Instead of killing her, and realizing at the last minute that it was not so. To save her life, the hunter had locked her away. Made her in a never ending resting state till one can wake her. 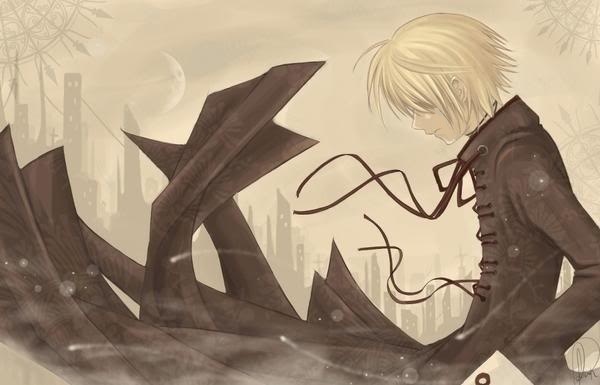 It had happened, a human looking to protect his kingdom. Willing to gain power and turn away his humanity awoken the blood demon. Other twisted, missinterprated ledgends began. She roamed till the 1920s. In an underground night club. Frozen with time with paniced bodies. An ice mage was able to incase the demon and all in the room. To forever remain in a deep sleep, and rest. In the room, the sound of music treaded softly to listening ears. Only when the blood of fire comes will the ice begin to mealt. The sound of a beating heart would come forth, and she will live again. 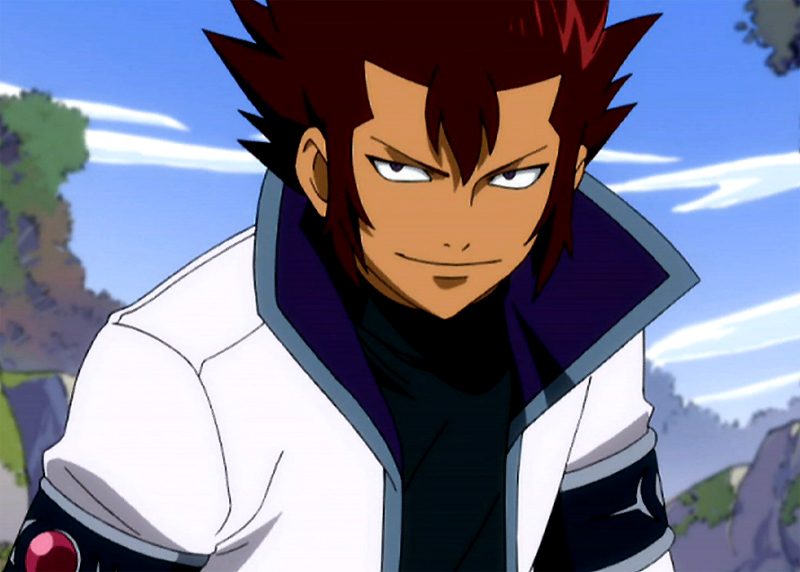 Personality:Very quiet and lonely but when is alone he tends to be a very easy target to bully. Power/Abilities: Black lightning form: Enhanced speed and reaction instincts increased for a specific amount of time. He may also paralyze his opponent with lightning but the amount of time he can stay in the form is decreased when used. Bio: Ever since he was born in a thunderstorm he has been obsessed with lightning. One day he went to the top of a mountain with his dad and when there was a storm on the mountain he let himself be struck by lightning, miraculously he survived. but when he was back he had gained that ability that was not fully controlable. When his parents were having problems with rent price he left them to pay for themselves. Anima: I diamond bladed dagger. Okay so Calibur youre not accepted until you fix:Power/Bio i told told to keep powers as realistic as possible this your power isnt realistic at all second you couldnt know about D.E.A.T.H. in anyway unless you been contacted by L one way or another. 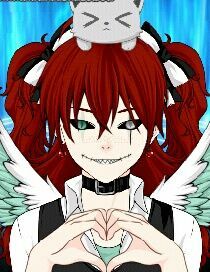 I would like to try to continue this RP as soon as possible, Kzoki has already given us the thumbs up to continue without him. Caliburn, from what I see, your character sheet is still incomplete here and there, so if you would like some assistance on how to word something, please message me. Lyn, I'm not sure what you've decided to do, but either way all of us will respect your decision. When everything has been fixed, I will contact Amaris, and she will decide when we continue. Nationality: Grew up In swamps of a forest near D.E.A.T.H. 's HQ. Power/Abilities: Enhanced speed, Agility, and Sight. Poison Claws and fangs. Immune to Poison. Bio/Reason of joining D.E.A.T.H. : His Father was a Part of a failed experiment to Create The ultimate reptile-human stronger than 50 men. Both of his parents died at the same day as birth both done in my Poison from the experiment. After 18 months of not being adopted, The adoption let him go free in the forest. He always loved using his abilities to kill animals or paralyze them to eat. He loved to drink poison more than anything because he likes the taste of metal go down his throat. He had a Pet Scorpion named Scorups. It had been his only friend in his childhood. Ever since it died of Age he has wanted to join d.e.a.t.h. after watching people he could relate to train. When one member talked to him He said: "I hope you will become whatever you want to be, I see potential in you."